If I had to guess at the location where the photo was taken I'd say that it looks like Gardiner Street, (but it could be somewhere else long since demolished), if it is Gardiner Street another guess is that it may be connected with the unveiling of the memorial to the 2nd Battalion Dublin Brigade which is at the rear of the Custom House. I've seen photos taken at the unveiling of that statue and the firing party then was made up of similarly kitted out men. I have 1054 Thomas Walsh which is a medal with Comhrac bar that came from the family and is named in lower case with initial capitals. Thanks Paul, that a definitive clarification of the official use of the lower case font. Perhaps someday I might get to grips with the official markings. 1. scan medals and pics. then-either sell by private sale, eBay (world wide audience) or go to one of the well-reputed auction houses (pay commission). here are the pics of the medal. I will post the names and details after I speak with my dad so they are right. will result in more interest and better offers on your items. these medals have not been shown in over 30 years and are in perfect condition. the boxes are shabby however. They where given to my grandfather by the recipent and then went to my dad and now they are with me. it would be great for them to have a good home where the history can be preserved. Gentlemen, I pointed a 1916 veterans' descendent in the direction of the GMIC to further his research and he has posted a new topic in this forum. I am aware that this particular topic is "watched" by a lot of interested persons and am thus taking the liberty of highlighting here, his new topic "1916 ICA Action". Regards Paul. It is my Wife?s Granddad who is in the picture he is directly behind the front Mans left shoulder, his name Ellett Elmes he passed away in 1958, so unfortunately cannot be the 66 celebrations. "The British now tried a new scheme whereby prisoners were offered conditional offers of liberty which meant that they would be released if they signed a written guarantee that they would keep the peace. Of the 600 remaining prisoners, only 3 opted for this. The first was an Irish Citizen Army man, Ellett Elmes, who signed the approved undertaking on the 24 October and further a bond in the amount of ?25 was executed by a Church of Ireland Minister, Rev E H Lews-Crosby, from Rathmines on his behalf." This is my first visit to this site and I have just seen your posting of 29/1/2009. The Henry Coyle you mention was my grandfather. 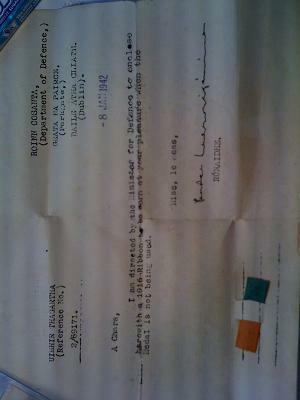 He was killed during the evacuation of the GPO and his son (my father) was born three months later. There is a photo of my grandmother and my father as a baby in The Catholic Bulletin which listed biographies of all the Volunteers who were killed in action during the Rising. Can you please explain the marriage relationship between my grandfather and your wife's grandfather? I have been looking at the Dublin census of 1911 and as far as I can trace, the Elmes and Coyle families both resided at 8 Rutland St. Upper in 1911. My grandfather and his family and your grandfather in law and his family both appear to have been residing at 32 Leinster Avenue at the time of the Rising. At some time after the Rising, your grandfather in law appears to have moved to 2 Eglington Terrace. My grandfather had been killed in the Rising but his younger brother Thomas (who also fought in 1916 in the City Hall Garrison, was subsequently interned in Frongoch and later fought in the Civil War) was living a few doors away at 5 Eglington Terrace. I would love to hear from you. Just read this thread now and have to say it's one of the most interesting threads I have read on any militaria forum. Splitting groups like that is horrific, words fail. 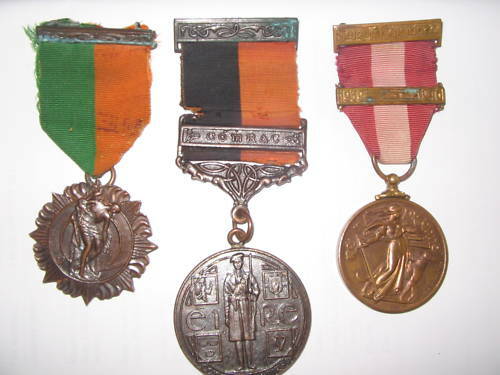 The collection consists of The 1916 Easter Rsing Medal, the Black and Tans 1922 Medal with a comrac Bar (combatant), and the 1939-47 Emergency Medal, My Grand Uncle took part in the Easter Rising in Bolands Mills, he took part in the Irish Civil war 1922 and later joined the Free State Forces. 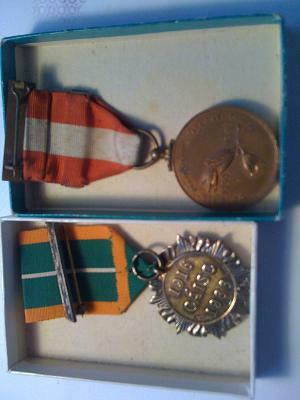 The 1916 Easter Rising Medal is in superb Condition, likewise its Green and Orange ribbon and its clasp. 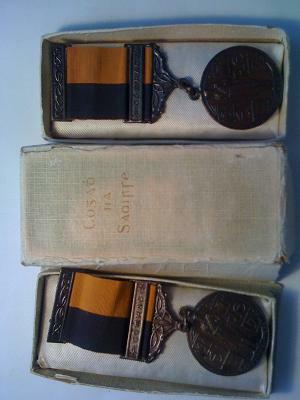 The 1922 Black and Tans Medal is also in superb condition, it has the Comrac (combatant bar on it) the Ribbon bears some age but is in very very good condition. The Emergency Medal 1939-47 Medal also in excellent condition and has its clasp attratched. None of the above Medals were ever polished or engraved, i will disclose to the winner, my Great uncles Name,,. Good luck in the Bidding, Thank You. After a quick look, all 3 medals certainly look genuine with nice patina. 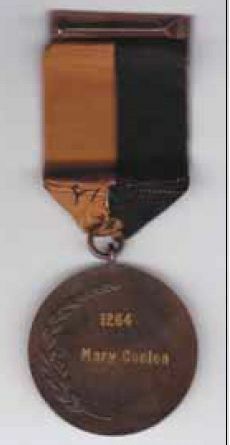 The 1916 medal also has the older and thiner top suspender bar but a rather tatty ribbon. I personally don't mind if ribbons are tatty as it adds a bit of personality and originality. Pity the seller hasn't used the word 'Irish' in the item heading as it would attract more bidders who search for Irish Medals. €8000......interesting starting price! too high maybe? I got these from my grandfather over 30 years ago. 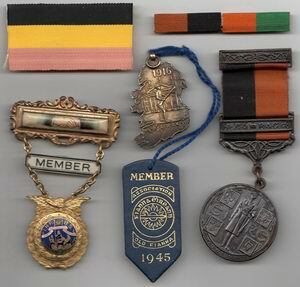 Strangely they came in an original 1916 box - not in the picture but someone with a 1916 medal and no box might appreciate it. I.N.F.B.S, Membership badge ..... I've no idea what this is. I'd appreciate if someone could ID the unknown items and give approximate values for as many items as you can. I'm thinking of unloading them .... Should I sell them privately, put them up on Whytes next auction or wait till 1915 ? I really can't understand your response. There is nothing wrong with selling them for money. I'm not a collector or historian. I've looked at them about once every 8 years ... usually when moving house! My advice would be to put them into an auction since it is very difficult to value these. The ribbons are for the 1916 Medal and the 1917-21 Medal. The 1917-21 medal without bar (what you have) is about EUR250 at the moment from the last few I have seen. The badges, however, are very difficult to value. Best of luck and let us know what you decide to do.